Trust. You have it or you don’t. It’s hard to build and easy to lose. Being ‘trusted’ is the key to relationship survival. Building relationships is critical for negotiators. 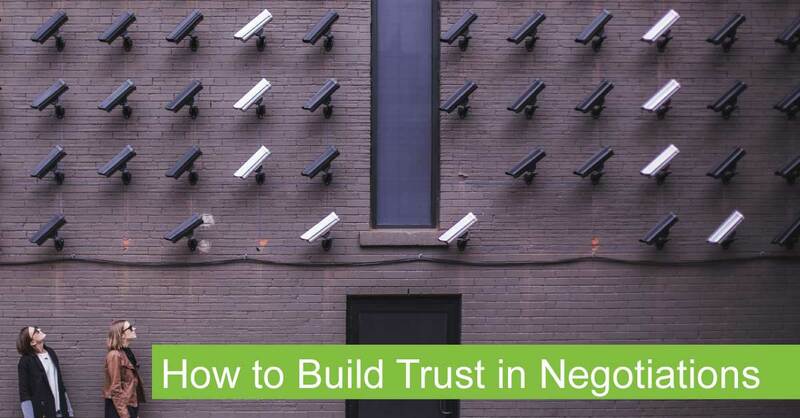 Negative accusations of lack of trustworthiness at both the inter-organizational(impersonal) and inter-personal levels are sometimes used as a negotiation tactic to gain leverage over the other side. At the inter-personal level, a lead negotiator might reprimand an indiscrete counterpart:‘I trusted you to keep our discussions off-the-record’. What is trust? It is the confidence of being able to rely on the other party to act as they say they will. We can identify two aspects of trust: an emotional feeling part that suggests or lack of it, and a performance track record part that confirms trust. Ask yourself, has there been a real failing in confidence? Or is it a tactical manoeuvre to exert pressure? Research suggests that our immediate reactions in negotiation are emotional rather than rational. Accordingly, negotiators need to carefully monitor the impact of using the word ‘trust’. Often the implied sub-text that we ‘mistrust’ the other is heard with the common reaction to this being a fight or flight emotional response. The accused person either attacks you as also being untrustworthy, or becomes defensive about their position. Neither reaction is helpful. To overcome this we suggest that negotiators refrain from using the word ‘trust’. The aim is to prevent an emotional reaction that fosters a negative negotiation ‘atmosphere’. Instead, we advise negotiators to focus on the more rational performance track record area. To overcome mistrust, rather than discussing views on people’s lack of trustworthiness, focus on building predictability. Develop compliance mechanisms that will ensure the other party’s commitment. To build trust, consider these suggestions below. And remember, lying kills trust. To discuss this article in more depth and explore developing your negotiation capabilities, please contact us via email or call +612 9299 9688. 'Trust', the big 'T' word! Many theorists prescribe that you must build trust in negotiations. But practically, is trust necessary? “Vertrouwen”, het belangrijke “V” woord! Veel wetenschappers dicteren dat je vertrouwen moet opbouwen tijdens een onderhandeling. De meeste onderhandelaars denken dat ze bedrog goed in de gaten hebben. De waarheid is dat de meesten van ons daar niet goed in zijn. Being ‘trusted’ is the key to relationship survival. Building relationships is critical for negotiators. Vertrouwd zijn is de sleutel tot het overleven van een relatie. Het opbouwen van relaties is van cruciaal belang voor onderhandelaars.